Although the modern metropolis now extends to the west side of the river, the original city of Bangkok and almost all its tourist sights lie on the east side of the Chao Phraya river. When the city was founded, a canal was dug around its original extents to make a defensible area now referred to as Rattanakosin Island. A wall and fortress defences originally protected the city. Some of the forts can still be seen today. This old royal precinct is where most of the major sights are, such as the Grand Palace, Wat Po and the National Museum. Click on a district for more information, or keep reading for a summary. Across the river is the old city of Thonburi, which existing long before Bangkok's founding. In fact, Thonburi was the capital of Siam for a short period before the new capital was established. One of the city's most recognizable landmarks, Wat Arun, is located in Thonburi. To the north of the old royal precinct is the Banglampu area, more commonly known as Khaosan Road, popular with budget travelers. 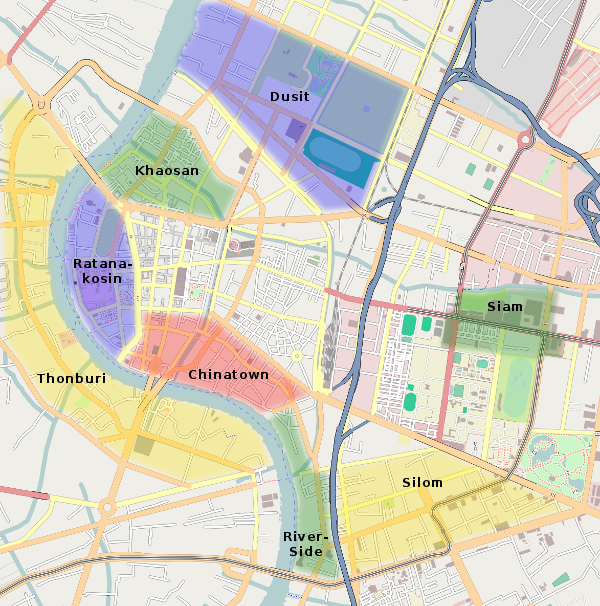 Further north and slightly east is the Dusit district, where the royal family's current primary residence (Chitlada Palace) is located, near to the houses of parliament and the Dusit Zoo. To the east along the river is the city's Chinatown district, called Yaowarat. Further east are the big riverside hotels set amid the oldest embassies and former trading houses of the west. Heading north away from the river at this point is Silom Road, home to many of the main tourist hotels as well as the city's most notorious "entertainment" area: Patpong. Still further north of Silom is the main shopping district centered on Siam Square, which includes Mahboonkrong (MBK) Center, Siam Discovery, Siam Center, World Trade Center, Narayanapand, Gaysorn Plaza, Amarin Plaza and Central Chidlom. A little further north of the Siam Square area is the Pratunam, the city's garment district. Heading west from Siam Square is the Sukhumvit road area, home to many more tourist hotels, business hotels and entertainment areas. For more information about the districts and sights of Bangkok, see our "Bangkok by District" page.